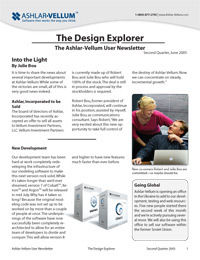 Welcome to the Ashlar-Vellum user newsletter, The Design Explorer. 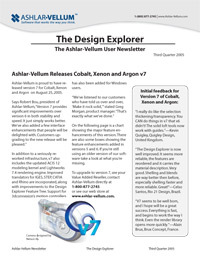 This quarterly newsletter serves our community of drafting and design professionals by providing news on events, products, our staff, and customer successes using our CAD and 3D modeling software on Mac and Windows. In each issue you will also find information relating to upcoming product releases as well as tips and techniques for accelerating your productivity. The Proven Success section spotlights the successes and innovations of our remarkable user community. Expand your possibilities with The Design Explorer. 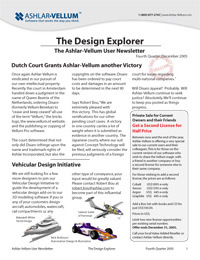 Has Ashlar-Vellum CAD or 3D modeling software contributed to one of your successes? If so, we’d like to help you tell the world. Maybe you were able to think through a particular design problem, beat your competition to market, work within a challenging infrastructure, create more freely, save time or save the world. Tell your story and let the world know about your outstanding design achievements. We can help. Click here for how to submit your story. Rio 21 on the Go with Obvio! What does this Mean to You as our Customer? Parawhatics? Who Needs Dimensionally Constrained Parametrics?